The Bibliography of Arizona Geology (AZGeoBib) comprises more than 13,000 citations of geologic studies from throughout Arizona. The citation record goes back to A.D. 1848! 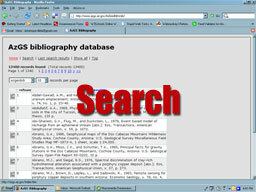 (Download a History of the AZGeoBib) AZGeoBib is outfitted with a robust, multidimensional search engine that when used appropriately is a powerful literature research tool; when used inappropriately, well…. At first glance, selecting the relevant search parameter(s) and the correct syntax is daunting. Below are some useful hints on effective data mining techniques. This in turn is followed by an example search of the Little Colorado River watershed. Last, if you encounter quirks, problems, or errors, or you simply cannot achieve a reasonable result, please let us know. We’ll do whatever we can to help.